Effective and use of digital financial services requires a comprehensive approach, according to a recent World Bank study. This post originally appeared on the World Bank’s blog. 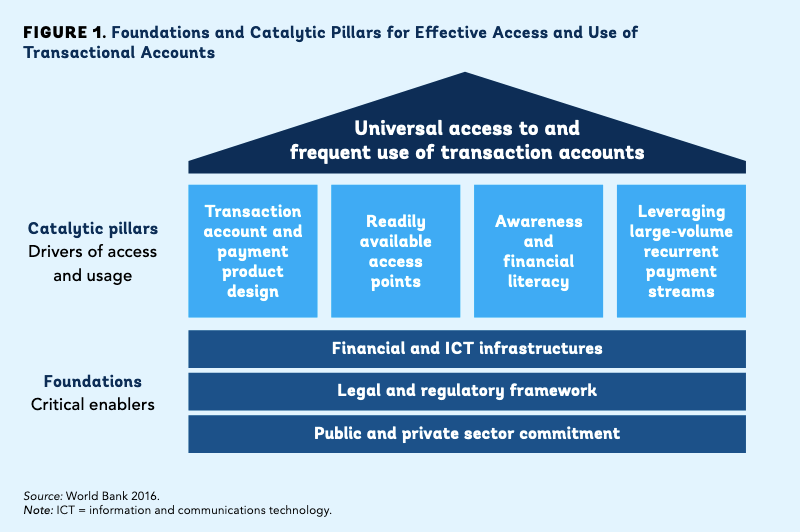 How can digital financial services effectively support financial inclusion? To answer this question, the World Bank recently collaborated with the Association of Southeast Asian Nations (ASEAN) Working Committee on Financial Inclusion (WC-FINC) on a study titled “Advancing Digital Financial Inclusion in ASEAN: Policy and Regulatory Enablers.” This study analyzes a wide range of digital financial services (DFS) through a framework based on that of the Payment Aspects of Financial Inclusion (PAFI) report. According to the use of the PAFI framework (see figure below), three foundations must be present to enable the spread of DFS: government and private sector commitment to DFS development, a sound legal and regulatory framework concerning DFS, and an enabling financial and information and communications technology infrastructure. Atop these three foundations stand four catalytic pillars that increase uptake and use of DFS: improving the design of DFS products (and of the regulations that govern them), expanding agent networks and other access points, spreading financial literacy, and shifting large payment streams to flow through digital channels. Conducting this study did not come without challenges. From its start, in early 2017, the authors struggled to define such fundamental concepts as DFS itself. (At the time, terms for the fledgling industry and its products, such as “DFS,” “FinTech,” and “e-money,” were often applied loosely and interchangeably.) They also struggled, at times, to tease out the effects of prudential regulations and financial data on financial inclusion, because many regulatory bodies treat the topic in isolation from other objectives. But the study team persevered, and they emerged from their task with the following advice for DFS policy makers and regulators. The policy and regulatory framework for DFS should be approached comprehensively, looking to enable not just the digital economy but also financial inclusion. The final shapes of the DFS ecosystems of ASEAN countries remain to be seen, but the work that ASEAN authorities have done and continue to do to understand these ecosystems, adjust their policies concerning them, and share the lessons they’ve learned with their regional and global neighbors is an encouraging start. The World Bank congratulates the ASEAN WC-FINC for having undertaken this study.